Apart from their fruit, citrus trees are also known for their splendid blossom going under the collective name of Zagara. The term zagara comes from the fusion of two Arabic words, Zahara meaning “beautifully bright” and zahr, the word for flower. Citrus flowers vary from one species to another and, for this reason, Zagara specifically indicates the flowers of lemon, bitter orange and sweet orange trees. The zagara flower has 5 brilliant white petals and, in the language of flowers, it stands for purity and fertility. This is the reason why orange blossom is often used in flower decorations for weddings to bring luck to the newly-wed couple. However, there are many other literary texts with poetic references to zagara. In the universally known novel, Madame Bovary, by Gustave Flaubert, the bridal bouquet of the elegant protagonist was made up of pure white orange blossom at the peak of their splendour. The well-known French writer Guy de Maupassant, visited Palermo in the second half of the 1800s and his description of orange blossom scent is so poignant as to perfectly render the idea of how intense this fragrance can be. In fact, he writes in "Sicily": «A continuous breeze arises from the perfumed gardens, a breeze that inebriates the mind... That aroma, suddenly enveloping you, mixing the delicate sensation of perfumes with the artistic joy of the mind, immerses you for a few seconds into a wellbeing of body and soul that comes close to true happiness». The zagara, however, does not only appear in literature but in pictorial art as well. In fact, in Botticelli’s Spring, the artist fully portrays the immaculate beauty of his Venus surrounded by other deities in a marvellous citrus fruit orchard in flower. Not surprisingly, since this is the season when orange blossom bursts into flower. The orange trees standing behind the deities represented in this work of majestic beauty are believed to symbolize marriage because oranges were thought to be the golden fruits donated by the Goddesses of the Evening at the wedding feast of Jupiter and Juno. Owing to their sweet and inebriating perfume of pronounced citrusy notes, zagara petals are used in cosmetics to produce the essential oils for home fragrances and beauty creams for face and body. 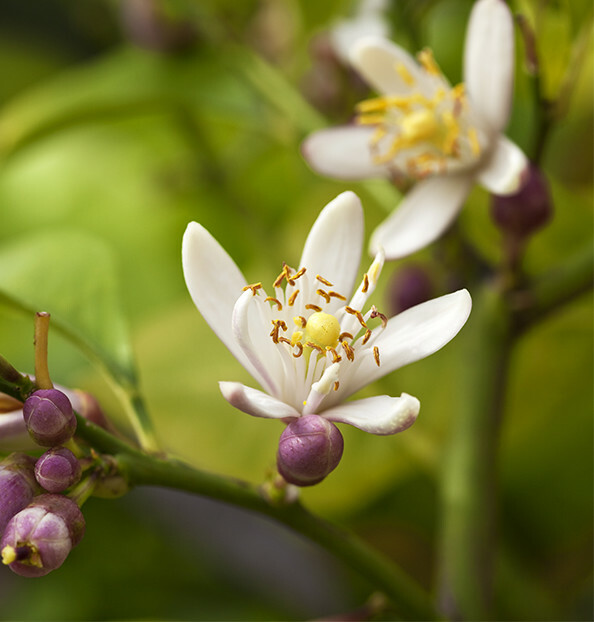 Bitter orange blossom is distilled and used in the production of neroli essential oil, known for its sedative, anti-depressant and tonic properties. What does zagara look like? The zagara is composed of 5 sepals attached to the stalk (the green petals holding the calyx) and 5 separate petals forming the corolla. The stamens, from 20 to 30 in number, are safely housed inside the corolla and on their tips it is possible to observe the quadrilocular anthers, that is to say, the part of the stamen containing the precious pollen whose bright yellow colour is similar to gold. It is thanks to the wide variety of citrus plant species that we can find zagara of different shapes and sizes: the pomelo, bitter orange and grapefruit have the largest flowers, followed by the sweet orange, lemon and mandarin orange. In the case of most varieties, the blossom falls in the early phase of fruit development whilst in the bergamot, the flower remains on the plant until the fruit has fully ripened. Many citrus varieties flower abundantly with proper bloom cycles mainly concentrated in the spring. In some species having between 100,000-200,000 flowers to a plant, only 1-2% of these complete the fruit cycle with the development of a citrus fruit.